It’s not every day that one travel to Iceland, so when luck knocked at my door to take me there for the third time, I ceased the opportunity to finally shot with fresh slide film. As landscape would be my main subject during this trip, I had no other choice but to try out Velvia! On top of aesthetic, I also wanted to capture those memories on something I’d be able to look at in 50 years no matter what. I’ve had my share of forever lost digital pictures so have a positive in hands was the safe way to pass these images through the years. If you’ve read my review of Street Candy ATM400, also shot on the Xpan, you already know that this trip for special for sentimental reasons. Why Choosing Velvia 100 VS 50? So sharp you can cut bread with those negs! When shooting such colourful landscapes like Iceland has to offer, you can’t go wrong with Velvia. It’s the best film to replicate (and saturate a bit more) what your eyes are seeing. Slide film in general, but especially Velvia is known for its vivid colours. Then came the choice of going for the 100 or 50 ISO. I opted for the extra stop on the Xpan, and kept the Velvia 50 to shoot on the Mamiya 7 that has a leaf shutter and I believe, suffers less from camera shake. According to Wikipedia, Velvia has the highest resolving power among any slide film. I you don’t know what Resolving Powermeans, it’s basically the number of lines per millimetre the film can capture. The more lines it has, finer are the details it can capture and translate into sharper images with crisp details. On digital cameras, you can compare it with the sensor’s pixels size. A large pixel won’t be as precise to define edges between elements, while a smaller pixel size will be able to see more details and draw sharper edges between elements. To get the most of this high resolving power, you also need good glass. Not all lens are equal when it comes to sharpness and details they can capture, same goes with the scanner. In my case it was shot on the Xpan’s 45mm lens and got Ultra HD scan from Nation Photo. With this trio you can only get incredibly crisp images! (HD photos in this Flickr gallery). Slide film is also known for having very little grain when compared to colour negative and it’s true that I’ve never seen such clean images shot on film! 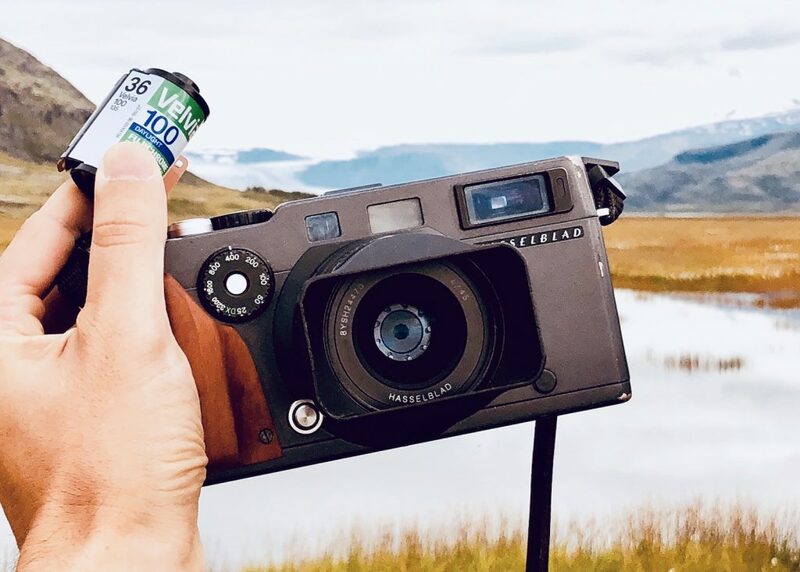 Shooting Velvia, or slide film in general, can be difficult to apprehend if you aren’t experienced with with how light meters work. The exposure latitude is really narrow compared to what we are used to with colour negative, and not as forgiving! What that means is that you have to be careful with your metering and the type of scenes you want to capture. The Exposure Latitude is measured in stops of light and goes from complete darkness to 100% bright (ex: sunlight). Our human eye can see betwneen 10-14 stops, colour negative film about 13 stops (that’s why it’s very forgiving to overexposure), about 15 stops for high-end DSLR and only 5-6 stops of light for slide! That doesn’t leave much room for mistakes and an accurate meter is essential to obtain good results. I wouldn’t risk guessing my exposures with the Sunny 16 rule! In other words, it means that slide won’t be able to capture, at the same time, information in high lights and shadows. In high contrast situations, you’ll have to make a decision: Expose for the highlights or shadows but you can’t have both on the same image. In case you go for the highlights, there will be very little details (if not pitch black) in your shadows. This can be used at your advantage to create nice silhouette images. Now let’s look at some situations that were really not suited for such a sensitive emulsion and it will give you a better idea of its limited latitude. If you expose for the shadows, highlights will be completely blown out and all information will be lost. There’s absolutely no recovery from a burned slide film and you can drag the highlight slider all the way down but nothing good will come out of that. Like with the example below, it’s usually the sky or light source who’ll suffer first. Here I exposed for the foreground and lost all details in the clouds. Hopefully my Xpan has a good meter and most pictures turned out decently exposed but still got a few terrible ones because I wasn’t careful with the meter reading OR the type of scene I was shooting. With the examples below, we can see that there was too much contrast between the foreground and background in these scenes. The clouds looked amazing in real life but slide film wasn’t able to capture what I was seeing due to its limited latitude. This is exactly the type of scene that will give a hard time to this film. To overcome this limitation, the solution would have been a graduated ND filter to block the highlights and be able to expose for the shadows without loosing details on the sky. That’s definitely something I want to try because when you see what Alex Burke is able to achieve with this filter, it takes the whole game to another level! Knowing what it can and can’t do will save you some disappointment and money, because slide film is expensive! For example, a 35mm roll of Velvia 100 will cost at least 13$ and around 15-20$ for developing. Add to that printing and/or scanning and it goes quickly around 40$ for a single roll !! Thankfully, I have Nation Photo on my side who took good care of my rolls and process them for me. When you develop slide film you get a positive image, meaning that you can look at the film and see the images. Remember those family reunion when our parents and grand-parents used to show us their last holiday pictures projected on the wall in the living room? That’s slide film and it’s also known E6 (diapositive or colour reversal film) because of the chemistry used to develop it. With colour negative film, you get an image with inverted colours and need to be reversed before being looked at. This processing, also known as C41 (also because of the chemistry) is widely available and affordable. So before buying your first roll of slide, make sure that there’s a lab where you can have it processed. Some labs send them off to have it developed by someone else, which can make it even more expensive. To avoid paying someone just for sending the film for you, make sure to ask if they develop it in house. If you don’t have any good place nearby, there are plenty of labs you can mail it to. I’m sure there are many options in the US but for Europe I recommend Nation Photo. OR if you’re not intimated by E6 processing at home, you can do it yourself at home. Have a look at this complete tutorial by Sina Farhat who shares steps by steps his technique to develop slide film at home using the Tetenal Colortec E6 Kit. I’m completely new to shooting slide for being able to appreciate all the subtleties between the two Velvia, but for what I’ve seen until now I tend to like more the 100 version. There’s, in some situations, an unflattering green cast with the Velvia 50 that doesn’t give credit to original scene. Velvia 100 has a slight magenta cast that I prefer for the type of scenery I was shooting. Sometimes it’s a little too pronounced, especially in the blues, but that doesn’t bother me too much. That’s just a first impression and to really determine my favorite I’ll have to do a fair comparison with both film shot with the same lens. Will I shoot Velvia again? Definitely YES! But now I want to try other slide film stocks and explore the wonderful world of colour reversal photography! If you haven’t yet, definitely get some and slide ready in your camera bag! Hope these samples of Velvia 100 inspired you to give it a try and if you really want to get a better taste for it, have a look at all the HD pictures show in this review, and more, in this gallery. Thanks for reading and if you have any tip to share about slide film, please let us know in the comments.